Treatment of lung cancer requires the services of several specialists. A Memphis project is examining whether patient outcomes improve when care providers come together in a coordinated program. September 2018—As PCORI-funded studies produce results of interest to patients and those who care for them, we are updating the stories of those projects. The article below was published in August 2015. You can read an update to this story here. Lung cancer survivor Mark Ill owes a great deal to his sister, Toni Ill. In 2008, Mark was uninsured and without a primary care provider when he was diagnosed with lung cancer that had spread to his brain and adrenal gland. Toni drove him to appointments with specialists throughout the Memphis area, took extensive notes at each appointment, searched the Internet for solutions when Mark’s doctors had none, and relayed messages when providers failed to communicate with each other. But even working as a team, the siblings struggled to cobble together a care plan involving a pulmonologist, a neurosurgeon, oncologists, radiologists, and other specialists. Mark’s doctors didn’t consult with one another about the best course of action, even when complications arose from treatments. In fact, his initial oncologist became angry and dismissed Mark as his patient after Mark underwent surgery without letting him know. Mark had wrongly assumed the surgeon and oncologist were in touch. Today, Mark and Toni Ill sit on the Community Advisory Board for a PCORI-funded project that aims to optimize care delivery for lung cancer patients. The project, led by lung cancer specialist Raymond Osarogiagbon, MD, is gathering under one roof a team of specialists as part of a multidisciplinary clinic that provides highly complex care for lung cancer patients. The program is housed at Baptist Memorial Hospital Memphis (Tennessee), a community hospital that serves a diverse population. "We want to be active at the very front end in deciding what does this patient need, who has the skill set to attend to that need, and how can we match each patient to the right doctor to do the right tests and provide the treatments that will get the best outcome," Osarogiagbon says. "That in a nutshell is the challenge we took on." With the team in place, Osarogiagbon plans to test whether that patient-centered multidisciplinary model improves outcomes, including patient survival. 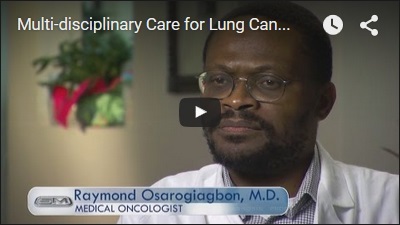 "The issue we’re dealing with is how best to deliver care to patients with lung cancer," says Osarogiagbon, whose patients simply call him “Dr. O.” He suspects that what the team learns about lung cancer care can be extrapolated to other complicated healthcare delivery problems. We’ve known for years how to take care of this cancer properly, but we have often failed to do it. Lung cancer kills about 160,000 Americans each year, which is more deaths than those caused by the next five top-killing cancers combined. The proportion of patients surviving lung cancer five years after diagnosis remains at less than 20 percent, unlike breast and colorectal cancers, for which five-year survival has dramatically improved in the last few decades to 60–80 percent. Part of the problem is that lung cancers require many specialists and specialized equipment to treat, particularly if the cancer has spread to other parts of the body. And, because many people diagnosed with cancer are smokers or former smokers, and lung cancer diagnosis tends to come at an older age than for other cancers, patients often have numerous other health problems that need to be managed. Several professional societies have recommended that lung cancer be treated with a multidisciplinary model. “But if you look across the land, there are precious few places you’ll find that,” Osarogiagbon says. He notes that 85 percent of lung cancer care is currently delivered with conventional serial care, in which patients such as Mark receive a sequence of referrals to see independent specialists. What’s more, even in the handful of major US cancer specialty centers that can deliver multidisciplinary care, it isn’t standardized or, in most cases, backed by evidence. The PCORI-funded project is evaluating a multidisciplinary system for delivering lung cancer care. The project has three phases. In the first, focus groups obtained input from a wide range of stakeholders, including patients and family caregivers; clinicians in all the specialties that manage lung cancer, as well as those who refer patients to them; and executives from both hospitals and insurance companies. All provided opinions about what should go into a multidisciplinary care system. “We wanted to learn from them instead of coming in with preconceived notions,” Osarogiagbon says. The next phase, now under way, is to build the program with specific goals. These include more than 85 percent of patients receiving the care recommended for their stage of disease, and communication among the patient and all care providers taking place within 48 hours of every clinic visit or other encounter. When the team recently reviewed records of patients who had undergone surgery for lung cancer, it found that 90 percent had not received all three of the recommended preoperative diagnostic tests. Once the multidisciplinary program has been established, the third step will be to compare patient-centered outcomes—including survival, patient satisfaction, and quality of life—between 150 patients in the multidisciplinary program and 300 patients receiving conventional serial care, in which they—through a sequence of referrals—see independent specialists. Results are expected in mid-2017. Patients and caregivers contribute to the planning and conduct of each of these steps. In addition to the Community Advisory Board, which meets monthly, a patient or a family caregiver co-chairs each of several task forces related to aspects of the program. As advisory board members, Mark and Toni Ill have been vocal about the need for better communication—particularly for low-literacy patients—and have also pushed for inclusion of mental health professionals in the specialty mix. Following Mark’s suggestion, the team brought a psychologist into the program. Goal: Create a multidisciplinary care model for lung cancer treatment in a community setting, and compare patient-centered outcomes from that program with those of patients managed with conventional care.